Given the number 1 single of 1983 had been a comedy release, it's hardly surprising that novelty records were big business the following year. This week in 1984 alone, the three new entries on the ARIA singles chart were all comic tracks to one extent or another. Two of the songs were musical parodies by actual comedians, while the third was a light-hearted song by an Australian folk band poking fun at a part of local culture. One of the singles even went all the way to number 1. At number 1 this week in 1984 was a novelty of a different kind - foreign language hit "99 Luftballons/99 Red Balloons" by Nena stayed on top for a fourth week. Kind of an odd time to be releasing a solo single with Dragon's Body And The Beat album weeks away from release. This would end up as the title track of Marc's next solo LP, released in 1985. This was pretty much the last gasp of Sheena Easton's sweet and innocent era. Before long, she'd ditch the big weepie ballads to raunch her way back up the chart. "Soldier Of Fortune" had put him back in the top 20, but this similarly synth-y follow-up couldn't get past number 87 - it spent four weeks there. This would be JPY's last new song to reach the top 100, but he'd be back in 1992 with the revival of "Love Is In The Air". 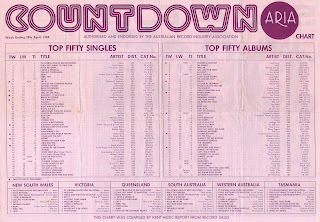 The last time we'd seen Redgum on the top 50 it'd been with the sombre wartime lament "I Was Only 19". Exactly a year after that chart-topper entered the top 10, the folk band returned to the chart with this more upbeat ode to Aussies abroad. Name-checking places like Kuta and Legian, where droves of Australians still travel every week, "I've Been To Bali Too" was a tongue-in-cheek look at why the Indonesian island is such a popular holiday destination. I have vivid memories of watching Mel Brooks films in the '80s - Blazing Saddles, Spaceballs, History Of The World, Pt I - but I don't actually recall seeing war comedy To Be Or Not To Be. I do, however, remember the accompanying single of the same name, which was otherwise known as "The Hitler Rap", in which Mel pranced around dressed as the Führer, telling the story of the Nazi party - well, kinda sorta. I don't think I realised just how big a hit "To Be Or Not To Be" was, but it was Mel's only successful tie-in single in Australia, with previous efforts like "High Anxiety" and "It's Good To Be The King" not tickling enough funny bones to chart. Musically, the song sounded like a cross between "Wham Rap! (Enjoy What You Do?)" and "Puttin' On The Ritz", and was another example of an act making use of rap outperforming actual hip-hop artists on the top 50. He'd already parodied massive hits like "My Sharona" (as "My Balogna"), "Another One Bites The Dust" (as "Another One Rides The Bus"), "I Love Rock 'N' Roll" (as "I Love Rocky Road") and "Mickey" (as "Ricky"), but it was his take on a song by the King Of Pop that provided "Weird Al" Yankovic with his breakthrough in Australia. A send-up of "Beat It", "Eat It" had Michael Jackson's seal of approval and came with a video that recreated the original clip scene for scene. In fact, I'd suggest it was the video as much as - if not more than - the comic lyrics that resulted in "Eat It" going all the way to number 1 in Australia. Since "Eat It", which won the Grammy Award for Best Comedy Recording, "Weird Al" has continued to take the piss out of music biggest hits for decades, including having another stab at Michael Jackson four years later. Next week: back to some proper music, with three excellent homegrown synthpop tracks and the follow-up to one of the most talked about singles of the year. Ah yes. I remember first hearing 'Eat it' when MJ died back in 09. Me & other mates would constantly play it in class & I downloaded it onto my phone. We came across Weird al's 'Fat' as well at the time & cracked ourselves piss laughing throughout the video. Great parody & imitation of the King of Pops 'Beat it'. Love that 'Thriller' reference at the end of the vid. Think I saw the 'Hitler Rap' about 3 years ago, seeming I found how high it surprisingly reached our charts. Guess we know where U2 got their album name from with the 'Achtung Baby' quote at 1:11 lol! Throwing an arcade video game out the window was a unique concept in the Sheena video. I first heard the Redgum track when studying Indonesian at high school in the mid-90s. I thought it sounded so dated and crap, though it's better than I remembered listening now. I was most surprised when I found out it actually charted. Something like the Mel Brooks song would probably never get released now. The Weird Al parody would be nothing without the video. "Eat It" was a massive airplay hit when it was released. In the time before "Rage" and MTV, videos were only ever shown during the designated Saturday morning video shows (e.g. "Saturday Jukebox", "Clipz", "Sounds" etc.) and on "Hey Hey It's Saturday" (which premiered many videos). 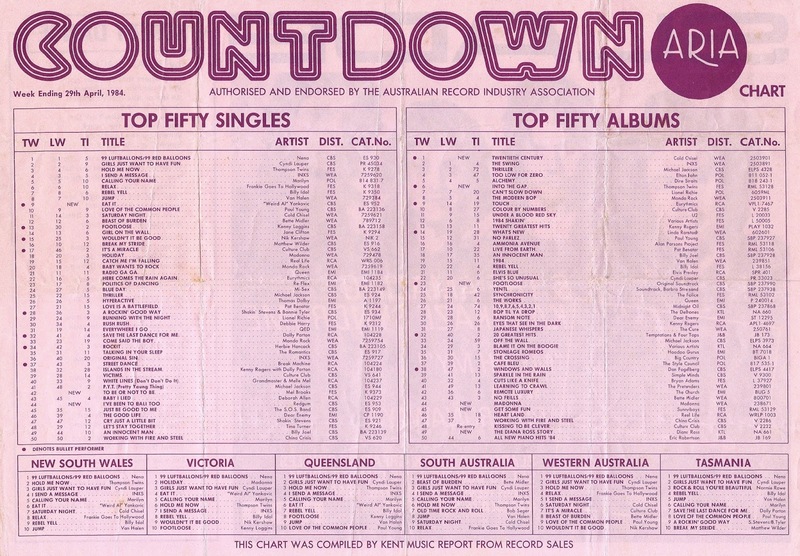 Of course, "Countdown" was the biggest source of video exposure in Australia and played an enormous part in a single's success (or lack thereof, sometimes, because if Molly didn't get behind a song, it struggled). Without widespread exposure at radio, songs had to rely solely on weekend exposure, so airplay was crucial. "Eat It" had an iconic video, but I really believe that the song itself was strong enough to get it to the top.